A Vue.js component which serves as a picture file input with image preview, drag and drop feature, mobile-friendly, EXIF orientation, custom settings, and more. 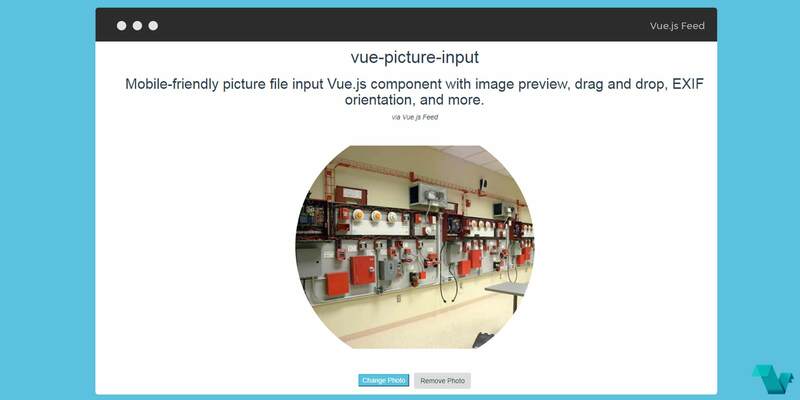 There is an example project making use of the vue-picture-input, available here. There are props and events below you can use to make it fit to your needs. width, height: (pixels, optional) the maximum width and height of the preview container. The picture will be resized and centered to cover this area. If not specified, the preview container will expand to full width, 1:1 square ratio. crop: (boolean, optional) set :crop="false" if you wish to disable cropping. The image will be resized and centered in order to be fully contained in the preview container. Default value: true. margin: (pixels, optional) the margin around the preview container. Default value: 0.
radius: (percentage, optional) The border-radius value for the container. Set radius="50" to get a circular container. Default value: 0.
plain: (boolean, optional) Set :plain="true" to remove the inner border and text. Default value: false. accept: (media type, optional) the accepted image type(s), e.g. image/jpeg, image/gif, etc. Default value: 'image/*'. size: (MB, optional) the maximum accepted file size in megabytes. removable: (boolean, optional) set :removable="true" if you want to display a "Remove Photo" button. Default value: false. id, name: (string, optional) the id and name attributes of the HTML input element. buttonClass: (string, optional) the class which will be applied to the 'Change Photo' button. Default value: 'btn btn-primary button'. removeButtonClass: (string, optional) the class which will be applied to the 'Remove Photo' button. Default value: 'btn btn-secondary button secondary'. prefill: (image url or File object, optional) use this to specify the path to a default image (or a File object) to prefill the input with. Default value: empty. mediaType: (string, optional) the media type of the image, i.e. "image/png"
toggleAspectRatio: (boolean, optional) set :toggleAspectRatio="true" to show a button for toggling the canvas aspect ratio (Landscape/Portrait) on a non-square canvas. Default value: false. autoToggleAspectRatio: (boolean, optional) set :autoToggleAspectRatio="true" to enable automatic canvas aspect ratio change to match the selected picture's. Default value: false. changeOnClick: (boolean, optional) set :changeOnClick="true" to open image selector when user click on the image. Default value: true. aspectButtonClass: (string, optional) the class which will be applied to the 'Landscape/Portrait' button. Default value: 'btn btn-secondary button secondary'. zIndex: (number, optional) The base z-index value. In case of issues with your layout, change :zIndex="..." to a value that suits you better. Default value: 10000.
remove: emitted on picture remove. click: emitted on picture click. And there it is, a customized input which accepts images & gifs for uploading, easy and fast. This project is open source available on GitHub.